What Else Can I Expect From an Online Master's in Information Systems Security Program? Information systems play a vital role in today's private companies, organizations and government agencies. An information system is defined as a set of tools, programs and platforms used to collect, evaluate and organize various types of data. Historically these systems have been paper-based, but most contemporary models are primarily computer-based systems consisting of software, hardware and online networks. Due to this digital reliance, the need for qualified information systems security analysts, advisors and consultants is at an all-time high. Many of these professionals get their start at the college level. Although a bachelor's degree is considered the minimum educational requirement for most information systems security occupations, those who go on to earn a master's degree in this field will be well-positioned to compete for top jobs. Master's in information systems security programs tackle two core areas of study: the algorithms, methods and platforms that drive today's information systems; and the best-practice measures for ensuring that the data in these systems remains private and protected from outside threats. The bulk of graduate-level programs available in information systems security are classified as either Master of Science (MS) or Master of Professional Studies (MPS); both pathways lean more on technical proficiency and less on theory-based coursework. These programs often culminate in a capstone course, and may also include internship requirements (though these are somewhat rare). Many of today's students are choosing to earn their online master's in information systems and technology online. Web-based students follow the same rigorous curriculum as their brick-and-mortar counterparts, leading to the same number of job opportunities for successful graduates. The asynchronous (or self-paced) schedule and study-from-home format are also ideal for students with part-time jobs, childcare duties and other commitments that may interfere with campus-based learning. Learn more about what you can do with an online master's in information systems and technology and what kind of career opportunities you can look forward to with this comprehensive guide. IS A MASTER'S IN INFORMATION SYSTEMS WORTH IT? Earning a master's in information systems degree is worth it for those who a bachelor's degree in a similar subject and want to advance their career in information technology. WHAT CAN I DO WITH A MASTER'S IN INFORMATION SYSTEMS? Graduates with a master's in information systems can pursue careers as computer security specialists, network architects, and information system managers. Read more here..
WHAT IS A MASTER'S IN INFORMATION SYSTEMS? A master's in information systems is a graduate degree that emphasizes two core areas of study: the algorithms and methods that drive today's information systems and best practices used to ensure data security from outside threats. SHOULD I GET A MASTER'S IN IT OT INFORMATION SECURITY? Master's in information security programs emphasize the protection of data, while a master's in IT degree is a more generalized degree that can lead to many different careers in the field of information technology. Read more here..
HOW MANY YEARS IS AN INFORMATION SYSTEMS MASTER'S DEGREE? Most information systems master's degrees include 30 to 40 credits of coursework can be completed in just two years. Read more here..
WILL AN ONLINE MASTER'S IN INFORMATION SYSTEMS SECURITY PROVIDE ME WITH THE SKILLS I NEED TO ADVANCE MY CAREER? Since most information systems security professionals enter the workforce with a bachelor's degree (or less), the master's is an ideal stepping-stone for students who aspire to leadership positions in this field. The master's curriculum is designed to build on the foundational coursework of undergraduate studies while introducing more advanced concepts and theories related to security analysis, network administration, database management, and cybersecurity. Students who complete capstone projects will have the additional opportunity to draw on the knowledge and skills they have gained to craft -- and present -- a comprehensive research study related to their prospective field of employment. WILL AN ONLINE MASTER'S IN INFORMATION SYSTEMS SECURITY PROGRAM WORK WITH MY SCHEDULE? Online information systems security master's programs offer a flexible, easily accessible alternative to traditional college education. Students will be able to download course lectures and readings, participate in virtual discussions with other students, submit written assignments, take exams and communicate with their professors from the comfort of their home computer. Current technology also enables them to study on the go using a laptop, tablet, smartphone and other Wi-Fi-compatible devices. WHAT JOBS CAN I GET WITH MY MASTER'S IN INFORMATION SYSTEMS SECURITY? Those who leave school with an information systems security master's degree will likely be prime candidates for senior and management roles. Common job titles in this field include information security analysts and specialists, network architects and administrators, database administrators and information systems managers. Due to high demand, job availability for master's degree-holders in information systems security is strong throughout the private, nonprofit and government sectors, particularly in the IT, business and healthcare industries. WHAT ARE THE BEST ONLINE MASTER'S IN INFORMATION SYSTEMS SECURITY PROGRAMS? Choosing a program is an incredibly personal decision, and only you can properly evaluate whether a target school's strengths match your educational needs. The following ranked list of schools should serve as a helpful starting point in your search for the best online master's in information systems security programs in the United States. Our ranking is based on the courses schools offer, available specializations, student outcomes, career support services, and other criteria used to determine academic excellence. 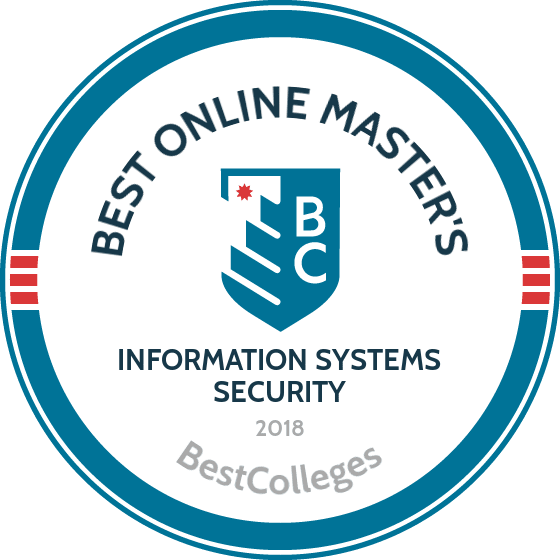 If you are considering an online master's in information systems security, be sure to contact admissions specialists at different colleges and universities to learn more their about specific requirements and offerings. Johns Hopkins University has offered programs from its Baltimore campus for nearly 150 years. Distance learners can earn many degrees, including an MS in cybersecurity, online. Before being admitted to this online master’s degree in information security, applicants must take at least one year of calculus, one semester of mathematics beyond calculus, a computer programming course that uses Java or C++, a data structures course, and a computer organization course. All learners can expect to take foundations of information assurance, cryptology, and foundations of algorithms courses. Online students can choose from one of three concentrations: analysis, networks, or systems. Standout topics within each specialization include introduction to ethical hacking, public key infrastructure and managing e-security, and Java security. Degree seekers who have a specific idea of their future endeavors can elect to complete three to six hours of independent study to focus on an isolated topic within the field. JHU’s School Of Engineering is home to a large number of qualified and experienced faculty who have continued working in the field of cybersecurity while maintaining their teaching roles. Students interested in learning more about what awaits them can attend one of the regularly scheduled cybersecurity/information systems engineering online information sessions. A range of archived videos and blog posts are also available on relevant topics, including a student/alumni panel that answers a range of frequently asked questions about the program and provides a message from the program chair. Many USC alumni have founded influential tech companies -- including UPROXX and Tinder -- and USC’s school of engineering maintains that focus on computers, technology, and emerging fields. Fortunately, distance learners interested in earning a master’s in information security online can now benefit from USC’s innovative reputation. USC now offers a master’s of science in cyber security engineering program online. Requiring just 28 credits, the program’s curriculum allows most full-time students to graduate in 18-24 months. Part-time students are generally able to complete their degrees in 2.5-3.5 years. The curriculum includes studies in applied cryptography, security systems, computer systems assurance, and computer forensics. Students also complete a course in policy, as one of the program’s stated goals is informing how policy affects decision-making in technology. Courses use case studies and scenarios to allow students to experience as close to a real-world work environment as possible. The program delivers coursework asynchronously. Applicants to the program must have an undergraduate GPA of 3.0 and submit GRE or GMAT scores. Students can also apply for admission as a “limited student,” a status that allows them to take courses in the program without actually being formally admitted to the degree program. As a private university, USC charges students the same tuition rate whether or not they live in California. USC is regionally accredited by the Western Association of Schools and Colleges. Students nationwide interested in earning an online master’s degree in information security would do well to investigate New York University. NYU recently committed to offering online programs across the arts and sciences and in many pre-professional fields, including a master’s of science in cybersecurity. NYU’s curriculum requires 30 credits and includes studies in applied cryptography; design and analysis of algorithms; and computer architecture. Students also choose between an advanced research project or a master’s thesis at the conclusion of their studies. You can also concentrate in Cyber Operations, leading to the completion of the National Security Agency Cyber Operations program. New York University is one of only 20 graduate schools in the country to be designated a National Center of Academic Excellence in Cyber Operations. One of the program’s major features is the virtual platform, a virtual lab that delivers hands-on experience with the latest tools in network analysis, penetration testing, and network security. The program combines synchronous and asynchronous elements to deliver coursework, and students choose between study fully online or a blended format requiring some coursework on NYU’s Manhattan campus. Applicants must submit GRE scores in addition to NYU’s application. Preferably, you have an undergraduate degree in computer science, mathematics, science, or engineering. NYU charges all students in the program the same tuition and awards a number of cyber fellowships, which provide up to a 75% tuition scholarship. Brandeis University, located in Boston, Massachusetts, offers the opportunity to enroll in online education. The school’s online master’s in information security leadership is constantly changing and teaches students to address pressing security issues while keeping their companies and clients safe. The program's 30 required credits can be completed in one-and-a-half years. Some of the required classes include principles of computer incident response and investigation, leading security in complex organizations, and information security management. Mandatory coursework consists of 18 credits, while the remaining 12 are devoted to electives. Elective courses include information technology forensics and investigations and software security testing and code assessment. To be considered for admission, degree seekers must either have existing work experience in a related field or have taken coursework focused on networking, computer security, and computer science. The graduate professional studies department hosts monthly online chats for students who want to discuss the program more before committing. Brandeis alumni have gone on to exciting roles as cybersecurity engineers, directors of information security, systems support specialists, and senior managers of network services. Some of the companies they work for include Raytheon, Sun Life Financial, RSA Security, Parametric Technology Corporation, and Analog Devices. Based in the city of Troy, Michigan, Walsh College of Accountancy and Business has spent the last century focusing on business education. With technology’s advances, however, Walsh College recognizes technology is a crucial element of business and now offers an online master’s of science in information technology (MSIT). Walsh College offers four concentrations for the MSIT program, including chief information officer, data science, cybersecurity, and global project and program management. The entire MSIT curriculum requires 14 courses for a total of 40 credits. In addition to core courses, students enrolled in the cybersecurity concentration complete studies in data and decision making; security program management; and current issues in cybersecurity. All coursework is available asynchronously, and students can choose between an online and a blended 2+2 format, which includes two hours of on-campus coursework and approximately two hours of online coursework each week. Most students graduate with their degrees in two to three years of study. Walsh provides all online students with lifetime career services, continuing to support students even after they graduate from the program. All applicants to the program must have an undergraduate GPA of 2.75 minimum. No GRE scores are required, but applicants should have two years of relevant work experience. As a private university, Walsh charges each online student the same tuition as their on-campus counterparts. Walsh is regionally accredited by the Higher Learning Commission. Western Governors University offers affordable, self-paced online programs in business, education, health sciences, and information science. Online learners who seek a great deal of flexibility in earning their online master’s in information security should investigate WGU’s program, which awards a master’s of science in cybersecurity and information assurance. WGU’s cybersecurity master’s program delivers coursework asynchronously and requires students to complete a total of 30 competency units (CU), WGU’s credit equivalent. The main difference between a traditional credit and WGU’s CU is the following: instead of being time-based, a CU is awarded when students prove they know and understand information completely. Students can take tests, submit projects, and write papers to earn CU. The program includes 10 courses, including studies in ethical hacking, cyberwarfare, and secure network design. The capstone project integrates a real-world business problem with the components of the degree and culminates in a remote, oral defense in front of a WGU information security faculty panel. Throughout their time at WGU, online students receive 16-hour-a-day access to the school’s student services team. Applicants to the cybersecurity program do not need to submit GRE scores, and WGU does not list minimum GPA requirements for admission. However, all applicants to the program must have three years of relevant work experience. WGU charges students a per-term tuition rate because their programs are all self-paced. 89% of students earn their degree in cybersecurity and information assurance within a year. Western Governors University is regionally accredited by the Northwest Commission on Colleges and Universities. A Roman Catholic affiliated school based in suburban Dallas, the University of Dallas blends orthodox Catholic principles with academic strength. The school offers graduate and undergraduate programs in the liberal arts, business, and ministry. UD offers many of those programs online, maintaining a relationship with Pearson Learning Studio’s eCollege since 1999. One such online program -- the master’s of science in cybersecurity -- requires students to complete just 30 credits. Students often complete their degree in 2-3 years of part-time study. The program’s curriculum consists of 10 courses, including studies in business analytics, data protection, and operational cybersecurity management. All students must also complete a practicum in strategic cybersecurity, in which students take on a simulated project while playing the role of a cybersecurity manager. The University of Dallas delivers all online coursework asynchronously. Running on a trimester system, the program allows students to enter in the spring, summer, or fall terms. Online students can take six-week or 12-week courses, whichever fits their schedules the best. Applicants to the program must have earned a minimum undergraduate GPA of 2.0. UD requires neither GRE or GMAT scores, nor prior work experience in the field of information technology, to be accepted to the master’s program in cybersecurity. Once accepted, all students pay the same base tuition rate even if they are residents of the Lone Star State. UD is regionally accredited by the Southern Association of Colleges and Schools Commission on Colleges. Operating as a private research institute in Orlando, the Florida Institute of Technology serves students in and around the state and throughout the country through its online learning platform. The school, which is made up of just under 9,000 students, has more than 2,500 learners enrolled through its distance education program. Online offerings include an online master of science in information assurance and cybersecurity. The program is offered completely online, with no required campus visits. The master’s in information security online is made available through a partnership with Harris Corporation, a global security leader. In addition to learning under the guidance of some of the nation’s best experts on cyber intrusions and information security, students also have the opportunity to network with information assurance leaders and potentially gain an internship or even a job with the university’s partner organization. Students undertake a rigorous plan of study that has been evaluated by leaders in the field. The school has been designated a National Center of Academic Excellence in Information Assurance Research by both the National Security Agency and the U.S. Department of Homeland Security. The 33 credits required in this program typically take one-and-a-half to two years to complete, and all coursework is offered asynchronously. Required courses include biometric authentication technologies, cryptography and information hiding, and secure operating systems. Though not required, degree seekers can take an information assurance capstone project class as an elective and focus on a culminating project that combines learned skills and knowledge. Operating an array of campuses throughout metropolitan Boston, Northeastern University has seen its national profile rise rapidly since the turn of the decade. Northeastern’s master of science in cybersecurity is a modern program exploring key issues in information security and how technology helps resolve them. Requiring a total of 32 credits, the program’s curriculum includes required coursework in applied cryptography, computer system security, and network security practices. Students can round out their degree with such electives as cyberspace programming, terrorism and international crime, and information system forensics. The program’s capstone involves collaborating with students in technical, legal, and/or law enforcement programs to create an integrated study of a contemporary security issue. Northeastern delivers all program coursework asynchronously. All online students gain access to SMARTHINKING, an online tutoring system, and Collaborate, a web-enabled synchronous conferencing tool. The program assumes students have a computer science background; however, students who do not possess that background can apply for the university’s ALIGN MS in CS program, which includes foundational coursework in computer science. Students can apply for admission in either the fall or the spring term. GRE scores are required. Each student enrolled in the program pays the same base tuition regardless of where they live. Founded in 1864, the University of Denver continues to evolve with the city of Denver, CO, today. The University of Denver’s University College master’s of science in information and communications technology with a concentration in information systems security maintains their legacy of growth into the 21st century. Denver’s on-campus and online programs both run on a quarter system. Students can earn their online master’s in information security at Denver within 18 months of full-time study by completing 48 quarter credits. Students can also opt for a part-time course of study. Those 48 credits include studies in web-enabled information systems, computer and physical security, and network security (which includes a lab). Each student must also complete a capstone experience, choosing between a project, a seminar, or an interdisciplinary seminar. The project is essentially a more flexible version of a thesis, involving one-on-one work with an advisor regarding an issue in the information systems security field. The seminars also involve addressing a problem but with more discussion and class collaboration. Online course instruction is asynchronous, allowing students to work on their time. Denver does not list any admission requirements for the program except for an undergraduate GPA of at least 2.5. Denver charges each non-scholarship student in the program an identical per-quarter credit tuition, eschewing out-of-state fees. The University of Denver is regionally accredited by the Higher Learning Commission. Iowa State University, one of the flagship land and space-grant research universities, is located in Ames and was established before the Civil War. Because Iowa is a largely rural state, many students who want to gain an education rely on the school's varied online learning offerings. A popular option for postgraduate students is the master’s degree in information assurance, a completely online program that consists of 30 credits. Students have two separate options when considering their path: the master of science in information assurance or the master’s of engineering in information assurance. The first program includes 18 core credits, with six credits devoted to research or three credits devoted to a creative project/capstone class; the remaining hours are devoted to electives. The master's in engineering still requires 18 hours of core courses, but six hours must be in research; the remaining hours are devoted to electives. Core courses include information warfare, advanced computer networking, computer security, steganography, and wireless security. The program combines coursework from several different departments. In addition to leaning heavily on engineering, other disciplines that play a critical role include mathematics, management information systems, political science, and computer science. This information security master’s degree online is available to all students at the same cost, regardless of residency. The department also offers a range of information assurance professional development courses. The oldest college in the Magnolia State and the second oldest Baptist College in America, the Baptist-affiliated Mississippi College has operated for nearly two centuries. Originally specializing in arts, sciences, and languages, MC has since expanded and now offers programs in computer science, electrical engineering, business, education, and physician assistant studies, in addition to many online programs. One such online program -- the master’s of science in cyber security and information assurance -- is modeled after industry certification training courses at a fraction of the price. At only 30 credits, the program manages to cover a variety of cyber threat topics, including cryptography, network security, operating systems, and cloud computing. Full-time students graduate in as few as five semesters, or 18-24 months. Designed for professionals already working in the field, the program delivers coursework asynchronously for maximum scheduling flexibility. Applicants to the program must have earned an undergraduate GPA of at least 2.75 and must submit GRE scores. MC also requires applicants to have an undergraduate background in computer science (at least 26 credits). Students uninterested in completing an entire master’s degree can apply for admission to MC’s six course cybersecurity and information assurance certificate program. The certificate program requires a year of full-time study. Once they are accepted, all students in either program are able to pay the same tuition rate no matter where they live; however, tuition is per credit for all students. MC is regionally accredited by Southern Association of Colleges and Schools Commission on Colleges. Based in Fort Lauderdale, Florida, NSU offers learners a master of science in information assurance and cybersecurity targeted toward tech professionals seeking careers in the design and development of cybersecurity technologies. This versatile degree program gives students the skills to assess, program, and enhance digital security systems, with major topics in threat and vulnerability evaluation, cryptography, security models, access control, and web security. Full-time students can complete the online master's in cybersecurity in two years, taking advantage of a fully online learning platform that features convenient asynchronous courses. This 36-hour program is comprised of ten core courses in advanced development and system engineering, supplemented by two elective courses. Degree candidates who opt for a thesis track are not required to take electives, taking six credits of thesis courses instead. Students who pursue a thesis must receive approval from the program office before beginning their research. Cybersecurity students also have the option to take additional elective courses with approval from the program office. Because this information security master’s degree online program is designed for aspiring tech developers, applicants must hold an undergraduate degree in a relevant field, such as computer science, information systems, information technology, engineering, mathematics, or physics. Students interested in cybersecurity management or policy development (as opposed to design) are encouraged to apply for NSU’s master of science in management information systems, which offers an information assurance and cybersecurity management concentration. In addition to its full academic accreditation, NSU’s online master's in cybersecurity program boasts recognition by the National Security Agency (NSA) and the U.S. Department of Homeland Security. As such, Nova welcomes federally sponsored military and civilian applicants. Qualified degree candidates may use this program as a springboard to NSU’s Ph.D. programs in information assurance or information systems. DePaul University has the distinction of being the largest Catholic college in the U.S. based on enrollment. More than 23,000 learners are enrolled at the Chicago campus and through the distance education platform. The school offers a master of science in cybersecurity that is entirely online. The program combines studies from securities and information technology, which prepares graduates for many careers in cybersecurity. Courses are divided into four groups: introductory, foundation, advanced, and major electives. Examples from each of these sections include digital forensic techniques, software security architecture, governance policies in information assurance, and framework for web application development. Degree seekers can specialize their knowledge with a concentration in computer security; governance, risk management, and compliance; or networking and infrastructure. All online students must earn at least 52 credits to graduate. Degree seekers need to earn a minimum C- grade in all courses; a minimum GPA of 3.0 in the foundational courses; and a minimum, cumulative GPA of 2.5 across all classes. If learners maintain a GPA of 3.9 or higher, they graduate with distinction. Campus-based and online students receive identical diplomas. Distance learners are allowed to take the program in a hybrid format. Online classes are taught as recorded lectures. Aside from program administrators who are available through email or the telephone, the department hosts regular online information sessions that students can register for and attend. Based in the Shenandoah Valley in Virginia, James Madison University celebrated its 100th anniversary in 2008. It boasts one of the highest graduation rates among public and private universities in the south -- 82% graduate within six years. JMU’s Master of science in Computer Science with a Concentration in Information Security applies a unique “cohort” model, wherein students take a prescribed set of two courses each semester with the same group of students, fostering relationships with people who want to work in the same field. Students also participate in weekly classroom discussions; work on group and individual projects; and deliver their assigned work by deadlines. This rigorous academic program is 100% online, which makes the program especially suitable for working professionals. The program is highly technical, highly interactive, and one of the most comprehensive masters programs in Information Security in the nation. With asynchronous lectures, the program’s 33-credit curriculum includes studies in cryptography, advanced network security, Digital Forensics, and secure operations. Each student either writes a thesis or takes a comprehensive exam during their final two semesters. The program lasts a total of five semesters, or 20-30 months. Applicants to the program submit their graduate application online. Students who don’t have a Computer Science background will be required to take some of the four preparatory courses, depending on their background. All students are encouraged to take these courses as refresher. The prep courses are Object-Oriented Programming, Computer Organizations, Data Structures, and Foundations. Though JMU is a state school, all students enrolled in the information security program pay the same tuition per credit. JMU is regionally accredited by the Southern Association of Colleges and Schools Commission on Colleges. JMU is also one of the seven original universities named as a National Center of Academic Excellence in Information Assurance/Cyber Defense, a distinction awarded by the National Security Agency and the Department of Homeland Security. Located in Albany, New York, Excelsior College was founded in 1971 with the goal of catering to transfer students. Currently, the school accepts almost all transfer credits from regionally accredited universities. As such, students who have begun an online master’s degree in information security at a different college but still need to complete their studies are a good fit for Excelsior’s master’s of science in cybersecurity. Excelsior offers three concentrations for the master’s of science in cybersecurity as well as a general degree option. Regardless of whether you concentrate in policy administration, medical data security, information assurance, or have no concentration, the program requires students to take a total of 30 credits. All students must complete seven core courses, including foundations of cybersecurity, project management, and a capstone. Sample concentration courses include security policy and governance (policy administration); healthcare information systems (medical data security); and cyber attacks and defense (information assurance). Excelsior created the curriculum based on standards set by the National Security Agency and the Department of Homeland Security. Excelsior does not require a minimum undergraduate GPA, standardized testing, or work experience requirements for admission to the program; however, an ideal applicant already works in the information security field. Excelsior is a private college that charges all online students the same tuition, regardless of where you live. Excelsior is regionally accredited by the Middle States Commission on Higher Education. As one of only seven Lasallian colleges and universities within the U.S., Lewis University views its Roman Catholic foundation and heritage as a central focus. Founded nearly 90 years ago in Romeoville, Illinois, the school educates just under 7,000 students through on-campus and online learning programs. In response to the growing demand for more educated professionals to combat issues surrounding computer and network security, the school launched a master of science in information security that can be taken on campus or through distance learning. In addition to providing degree seekers with the technical skills needed to keep their clients and the public safe, Lewis’s program also emphasizes preparing graduates for managerial and leadership roles. Before taking advanced-study courses, all learners must take two foundational classes: computer organization and principles of programming. After completing the foundational courses, students take 18 credits of core topics, including encryption and authentication, intrusion detection, and data networking. All learners also complete a semester-long research project that is overseen by an expert in the field. The final 12 credits are devoted to fulfilling concentration requirements, which includes management and technical issues. Depending on the chosen specialization, students are expected to complete between 35 and 41 credits. Lewis is recognized by the Department of Homeland Security and the National Security Agency for being a Center of Academic Excellence in Information Assurance Education. The curriculum has been approved by the National Security Systems National Training Standards of Information Systems Security Professionals and Senior Systems Managers. A fast track program is available to Lewis University undergraduate students who are completing their bachelor’s degree and plan to begin the MSIS program immediately after graduation. City University of Seattle has graduated more than 50,000 students who completed their degrees on-campus and online. One of the programs that consistently receives lots of interest at CityU is the online master of science in information security, which is a 39-credit degree that does not have any on-campus requirements. Because CityU was designed especially for adult learners, flexibility is a focal point for this program. Students move through 16 focused courses that expose them to nuanced topics within the field. Every student is assigned a CityU adviser with whom they’ll develop an individual plan of study based on the pace they would like to graduate and which elective courses will be the most beneficial to their aspirations. The program’s core consists of 15 credits that cover foundational topics, such as system administration for information security, privacy and open systems, and ethical obligations within ethical security. Students must decide whether they’d like to concentrate their studies in cyber security environment or information security audits. Both paths require an additional 21 credits and focus on subjects like cyber warfare, intellectual property and espionage, and auditing techniques. The final three hours for every learner are devoted to either a case-study-based capstone project or completion of an extended thesis on a topic within information security. This online master’s degree in information security is recognized as a National Center of Academic Excellence in Cyber Defense Education by the National Security Agency and the Department of Homeland Security. National University operates physical campuses and learning centers throughout California and in Henderson, Nevada, in addition to an extensive online distance learning presence. Catering primarily to adult learners, National University’s online programs run on a fast-paced quarter system with classes just four weeks long, including the fully online master’s of science in cyber security and information assurance. Requiring a total of 40.5 quarter units, the program’s curriculum consists of nine core courses, including studies in threat modeling and intel; wireless and mobile security; and a three-part project. This culminating project integrates students’ project management and team building techniques to address a contemporary cybersecurity issue. NU delivers program coursework asynchronously, allowing students to complete coursework at their convenience. Aside from core courses, students can choose between specializations in ethical hacking and pen testing or information assurance and security policy. In the ethical hacking and pen testing specialization, a red vs. blue team exercise involves the red team attacking an infrastructure the blue team defends. Applicants to the program must have earned either a minimum cumulative undergraduate GPA of 2.5 or a minimum GPA of 2.75 during their last 90 quarter units. Students who have a GPA lower than 2.5 can still earn admission by submitting satisfactory GRE or GMAT scores. Once they are accepted, all students pay the same per-credit tuition no matter where they live. NU is regionally accredited by the Western Association of Schools and Colleges. Sam Houston State University has the distinction of being the third oldest college or university in the state of Texas. The school was founded in 1879 and was an early adopter of distance education. The university currently offers more than 20 degrees at the undergraduate and graduate levels. Online offerings include the completely-online MS in information assurance and security and an online MS in Digital Forensics. The online information assurance and security MS program was developed for degree seekers who either studied computer science or management information science at the undergraduate level or those with technical degrees that correlate to a minor in those topics. Online learners with no previous academic training in these areas will likely need to take a variety of STEM courses before being admitted. The curriculum consists of 36 credits, the first half of which is devoted to core curriculum studies in areas of database security, organization system security, and business continuity management. The remaining 18 credits are treated as electives, but they must be offered through the Information Assurance and Security department. Learners must pass a written examination and, in some cases, an oral exam. Students applying for this online information assurance master’s degree must provide transcripts, an updated resume, GRE scores, and two letters of recommendation. The admissions website notes that preference is given to applicants who hold a GPA of 3.0 or higher. Every new online student receives a scholarship of $1,000 to help offset educational costs. Named for its founders - the Sisters of Mercy - Mercy College maintains a Roman Catholic affiliation to this day, often implementing Jesuit educational values in its programs. Based in Dobbs Ferry, New York, Mercy offers over 30 undergraduate and graduate degrees fully online, including a master’s of science in cybersecurity. The program’s curriculum eschews concentrations in favor of providing a broad, wide-ranging background in the trade. Coursework includes studies in forensic computing, social implication of information security, and information assurance and management in the 30 credit program. Students also complete either a master’s project or a master’s thesis before they graduate. The thesis lasts two terms while the project lasts one. Students who do not complete their project or thesis in the allotted time must enroll in a one-credit capstone continuation course during the following term. Mercy delivers all program coursework asynchronously. Mercy does not list minimum GPA or GRE admission requirements for the online master’s in information security program; however, the college does expect applicants to have a basic background in computer science. Students who do not already have a computer science background can apply for Mercy’s BS/MS degree in cybersecurity. Mercy is regionally accredited by the Middle States Commission on Higher Education. Founded in 1819, Norwich University is one of the nation’s oldest military colleges and widely recognized as the birthplace of the Reserve Officers’ Training Corps. For over 20 years, Norwich has been offering online education, and today has master’s degree, bachelor’s degree, certificates and continuing education programs online. Norwich University has been designated as a Center of Academic Excellence in Cyber Defense by the National Security Agency and Department of Homeland Security. In the Master of Science in Information Security & Assurance program,students can complete the 36 credit program in as little as 18 months of full-time study. Delivering coursework asynchronously, the program offers concentrations in computer forensic investigation/incident response team management; critical infrastructure protection and cyber crime; cyber law and international perspectives on cyberspace; project management; and vulnerability management. Regardless of concentration, students in the program complete 24 credits (four courses) of core studies in foundational areas such as information assurance technology. Students may begin the program in March, June, September, or December. The program concludes in a one-week residency on campus in idyllic Vermont, which includes a graduation ceremony. Transfer applicants may bring up to 12 credits with them, with Norwich evaluating each of those credits on a case-by-case basis. Norwich University is regionally accredited by the New England Association of Schools and Colleges. University of Detroit Mercy is the largest Roman Catholic institute of higher education in Michigan, serving approximately 5,000 undergraduate and graduate students on campus and online. Though the school is often hailed for its law degrees, the master of science in information assurance is also another popular choice. Classes are taught faculty members with at least one decade of nationally certified expertise. This program requires students to earn 30 credits. The first nine hours are devoted to core topics in incidence response, secure acquisition, and cyber defense technologies. The cybersecurity concentration consists of an additional 12 credits, and the final nine hours of study are devoted to electives in areas of ethical hacking, system forensics, and security analysis. Some of these courses have been approved by the National Security Agency’s Critical Infrastructure Protection Board Committee on National Security Systems for Information Assurance Center of Excellence Certification. All classes are taught asynchronously. By completing three to four classes per term, students can graduate in four terms: summer, fall, spring, and summer. Bellevue University is located in Nebraska. Because the state has a relatively small population and is mostly rural, Bellevue’s online programs appeal to residents and nonresidents. The school’s master of science in computer information systems is available on campus and online. Both options are taught by the same qualified faculty who have years of hands-on, real-world experience in computer information systems and general business. The curriculum is interdisciplinary in nature, combining studies from computer science, psychology, and networking systems. Before being admitted, prospective students must take applied statistics and either intro to programming using Java or intro to programming using C#. The core curriculum includes the study of storage systems, IT strategy and policy, cloud computing, and computing platforms and network technologies. The information security master’s degree online offers three concentrations to choose between: database, software development, and IT security, each of which requires an additional nine credits, bringing the total credit requirement to 36. Most students finish this program in one-and-a-half years, but part-time options are also available. Alumni have found work as database administrators, database and systems network architects, computer systems administrators, and software developers. Applicants must have a GPA of 2.5 or higher in their undergraduate, upper-level coursework; submit letters of recommendation; and write an essay. GRE scores are not required. Regardless of whether a student enrolls at the Nebraska campus or online, both pay the same tuition rate. Students can pursue a variety of careers in cybersecurity with a master's in cybersecurity online degree. These programs offer a variety of concentrations that can customize a student's degree and prepare them for a specialized career in the field. However, many of the fundamental courses and learning goals are the same across all programs. The table below explores the fundamental topics that students will encounter during the completion of a master's in cybersecurity online. As noted above, program requirements can vary greatly from school to school. The sample curriculum below includes key course offerings that all students earning an online master's in cybersecurity will enroll in. Operating Systems: Courses focused on operating systems such as DOS, Windows, and UNIX help students understand the fundamental way that computer hardware works and how computers and their hardware interact with one another. These classes usually include an overview of services provided by operating systems, including processing, storage, and output data. Human Factors in Security: This course teaches students how to recognize and examine the ways in which people affect cybersecurity efforts. Coursework emphasizes ethics, practices, policies, and procedures and helps students develop their awareness and strategies to better protect organizations from security risks created by human behavior. Network Security and Defense: Students work through a range of cyber security topics such as protocols and analysis, and access control, to develop a full understanding of defensive measures and vulnerability assessment. Capstone: Many students earning an online master's degree in information security will have to complete a capstone project, which assesses the ability of the student to integrate classroom knowledge and skills into a final project that is often based on finding a solution to a real-world problem. How Long Does It Take to Get an Online Master's in Information Systems Security? When following a university's recommended course schedule, earning an online master's in cybersecurity will often take at least two years to complete. However, the amount of time required for each individual will vary depending on several factors, including whether a student studies on a part-time or full-time basis and whether the school's program is taught in a cohort or not. Students who are a part of a cohort model move through their program together as one group. Cohorts provide students with a community of peers who can support each other during their studies and who become valuable networking connections after graduation. Students can expect to complete an average of 30 to 36 credit hours to graduate. Global Information Assurance Certification – The Global Information Assurance Certification is the gold standard for cybersecurity certifications. Exam preparation for the GIAC certification is provided by the SANS Institute, and may be taken in a classroom setting or in a self-paced online format. Information Assurance Certification Review Board – The Information Assurance Certification Review Board sets the industry standards for information security and also offers certifications in seven different job-specific areas of the field, including computer forensics and penetration testing. Certifications are earned with the completion of a traditional multiple choice exam and a hands-on practical exam. What's the Difference Between an Online Information Assurance Degree and an Online Information Systems Security Degree? Although the terms "information assurance" and "information systems security" are often used interchangeably, each term bears its own distinction. The information security field focuses on technology, while information assurance is more concerned with overall risk assessment and resolution. Information assurance roles do involve a technology component, though the complexity of the technology is often much lower than it would be in an information systems security role. Information assurance professionals create security policies and procedures and develop strategies for the tactical deployment of technology that mitigate the risk of cyber threats, while information systems security professionals focus on protecting sensitive data and hardware from unwanted access. While both information assurance and information systems security are vital parts of an organization, they each perform different specialized tasks. Information assurance professionals are often hired as analysts, while information systems security professionals often find work as security administrators, network security engineers, or security directors. Accreditation is a formal recognition that an institution meets and maintains certain academic standards. Schools can either be nationally or regionally accredited, which can have an impact on how easily credits can be transferred from one institution to another. For example, regionally accredited schools often do not accept credits from nationally accredited institutions. Each geographic region of the United States has a non-governmental agency that oversees the accreditation of academic institutions. Prospective online students should pay attention to these accreditations when searching for schools. The most important factor of accreditation is whether or not a school's accrediting agency is recognized by the Council on Higher Education or the U.S. Department of Education; avoid schools that aren't accredited by either organization. The U.S. Department of Education (DOE), a government agency, and the Council on Higher Education (CHEA), a non-governmental association, are both tasked with recognizing and keeping records of legitimate accrediting organizations throughout the nation. The U.S. Department of Education provides a database of all accredited schools and is required to oversee and enforce all standards of each accreditation agency. Before choosing your online master's in information security program, make sure that your prospective school is included on either the DOE or CHEA list of accredited schools. Despite the relative affordability of online master's programs, most students still need financial assistance. Students should complete a Free Application for Federal Student Aid (FAFSA) form to learn more about loans, grants, and other opportunities offered through the U.S. government. Additionally, private grants and scholarships are widely available through nonprofit organizations, companies, and other sources. Check out our collection of resources below to learn more about financial aid options.